With all of California's rivers and streams still running high and muddy my fly fishing options continue to be limited. For the past few months I've been researching fishing articles, reading online fishing reports, and mapping out new waters to find somewhere where I can wet my line. So far the best options that are within a reasonable drive seem to be Pyramid Lake and the surf. I had just fished Pyramid last weekend so Stinson beach day it was. The only article about fly fishing Stinson Beach I could find was from Loren Elloit published by Northwest Fly Fishing. 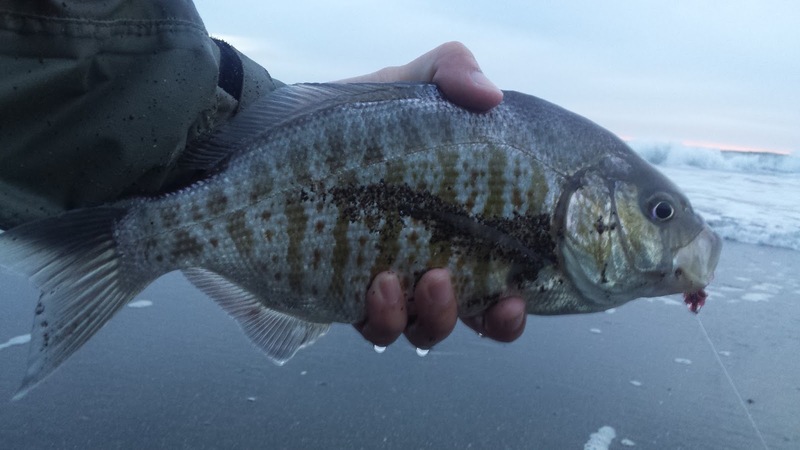 Dozens of online reports claim that there are plenty of surf perch to catch along with an occasional bonus striper, halibut, and rare leopard shark. About a month ago I tried fishing Stinson but left before the prime-time evening bite. I didn't catch anything that day but this time I was determined to catch a fish on the Stinson surf. 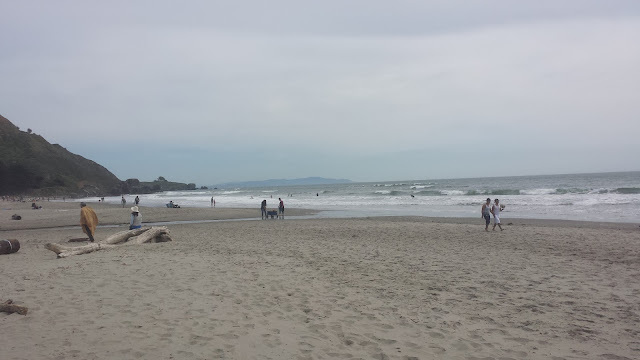 Stinson Beach is perhaps the closest beach to Yuba City. The 2.5 hour drive makes it a great choice for a fun day trip to the beach. After a smooth drive down from the valley the missus and I arrived at the beach at around noon. The weather was a bit on the cooler side which helped keep the crowds at home. I rigged my 6WT paired with a Teeny-200 line with a few crab patterns and worked my way south towards the rocks. Stinson beach is relatively shallow but sloped enough to where you should be able to find a few fish here and there. A few hours of covering water went by and my flies were still left untouched. I eventually met up with the only other fly angler there who was fishing next to the rocks. He had told me he caught two tiny surf perch and two crabs. This encouraged me to keep fishing but after another hour of nothing I decided to take a break. What was I doing wrong? Was I fishing the wrong places? Maybe I'm not getting down deep enough? Maybe I'm throwing the wrong flies? During my short break I rigged my 8wt and set out again to see if I could make something happen. I paid close attention to the fly angler and watched as he hooked up. Once he pulled the fish out of the water I started to laugh at myself. The fish he caught was about 5 inches long. He ending up catching at least three more small fish before leaving. Still fishless I took another break. "There's a fly guy catching fish but they are all babies" I told my fiancee. We both shared a laugh. I watched as all the other anglers fishing the beach packed up also leaving fishless. At this point the only thing I could think of was timing. My experience fishing the surf has taught me that the fish don't start feeding until the sun starts getting low. "You know that's what always happens" my fiancee stated. I set out again for the third time an hour before sunset with my 6WT and it wasn't long until I finally got my first take; my first jack smelt on the fly. I wasn't able to get a picture of it but it was a decent start from a slow afternoon. A couple of casts later I get a big take that's actually fighting back. Excitement began to rush in as I fought and brought in my first saltwater surf striper. It wasn't a huge fish but it was a surf striper nonetheless. I ended the evening on a good note with another first, a barred surf perch. So if the surf fishing is ever slow in the afternoon stick around and fish it in the evening. Tis the way of the surf. Awesome. 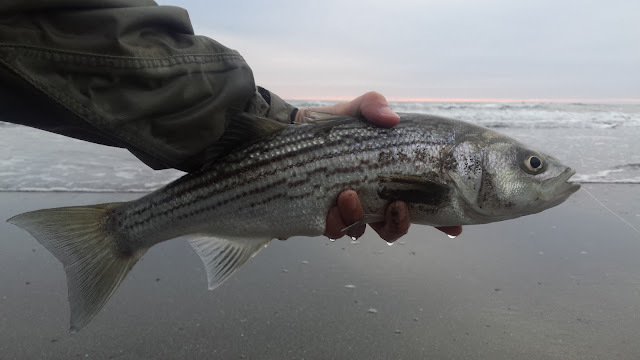 I got my first surf Striper this year too. Monterey Bay for me. Nice! I'm hoping to get out there again and catch a bigger one.